To understand how emotions relate to thinking and learning, you need to understand the parts of the brain. This illustration shows three basic parts. Let's look at them from bottom to top. Where the spinal cord meets the brain is a bulge called the brain stem. Notice that all impulses from the spinal cord pass through the brain stem. This part gives you bodily awareness of physical sensations. The brain stem is also responsible for keeping you safe from harm. 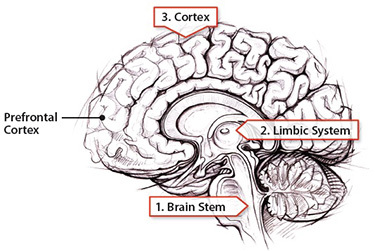 On top of the brain stem sits the limbic system. It includes parts of the brain that create basic emotions such as happiness and sadness. It also creates drives like hunger or thirst and is key to forming memories. Notice that signals from the spinal cord pass through the limbic system before they reach the highest part of the brain. At the top of the brain is the cortex. It is responsible for thinking, decision making, using language, and all other higher functions. Most of your classes are aimed at training this part of your brain. As you can see, however, signals from your body first go through the brain stem and limbic system before they reach the cortex. That's why you need to feel safe and connected (brain stem) and calm (limbic system) to learn effectively. Your Turn Check your knowledge of the brain parts. Answer the questions below. What does the cortex do? Why do you need to feel safe, connected, and calm to learn effectively? What do you do to feel safe? What do you do to connect with others around you? What do you do to calm yourself when you get upset? Understanding the Parts of the Brain by Thoughtful Learning is licensed under a Creative Commons Attribution-NonCommercial-ShareAlike 4.0 International License. Based on a work at k12.thoughtfullearning.com/minilesson/understanding-parts-brain.